Date of visit November 10th 2004, for lunch with Fred and three colleagues from work. Fred and I ended up driving into the wrong section of the Larkspur Landing and discovered Noonans. A good enough reason to try it for lunch? No No No! Turned out to be a big mistake. We waited 50 minutes for our mediocre and pricey lunch dishes to be delivered to our table. By that time we'd already been through 2 bread baskets which had taken the edge off our hunger. Our waiter was handling 8 tables to himself (a couple of which had at least 5 or more customers). This was unacceptable. Two of our party, iced tea aficionados, were not in the slightest bit impressed with their cold brews. (I tried a sip - it seemed like it had been made with a vanilla tea or something similar.) 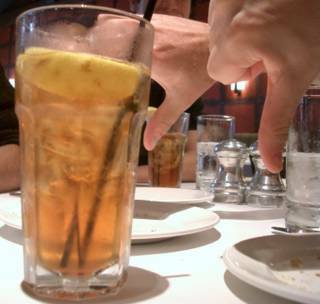 As one of them said, "I love iced tea but this is the grossest thing I've ever tasted" Everyone gave Noonans the big thumbs down. Four of us went to Noonan's in Larkspur on Saturday, the 2nd. I order the roasted chicken. I miniscule portion arrived. I brought it to the waiter's attention, stating that it resembled one half of a poussin, a baby chicken. He said it was the regular portion, and that they get special free range 2 pound chickens. A short time later the manager passed and I brought the matter to his attention. He said he inquired in the kitchen, and that they purchase "pepitos", a 2 lb free range chicken. I asked if any one else had ever complained about the portion, and he said no. I was amazed. After I had finished this tiny ( but delicious) thing, the manager returned and confessed that they had indeed received baby chickens weighing 1 1/4 lbs. He apologized for his ignorance about the matter. The upshot: He took 1/2 of the entree price off the bill because I had only received a 1/2 portion. Amazing! No offer of another portion, nor taking the entire thing off. I left hungry, and the entire table has told countless people of this silly act. By the way, do you suppose the chef was wearing blinders that night? That does seem a little petty: offering you half price because of the half size portion. I sometimes wonder what restaurant mangers are thinking! Whenever I have been comped a meal because of one problem or another I have always been impressed and more likely to give a place another go because at least they are recognising their mistake and emphasizing the importance of the customer. At least your tiny chicken sounds like it tasted delicious - we had rather large portions of fairly mediocre food when we visited. My visit to Noonan's was quite unpleasant. I had two guests with me, one from back East. When our waitress arrived, I began by ordering a glass of the house chardonnay. She asked, "What is that." Before I could reply, she brightened and said "Oh, you mean the cheapest one." Rather than leaving, I saw ahi tuna, my favorite, on the menu, I aksed her if they seared it with the center nearly raw. She said they cooked it very rare. My had been sauted. Not evn rare. Criminal to treat ahi tuna that way. there other 2 restaurants are brewpubs, they should stick to beer and burgers! We went to Noonan's last night for dinner. It was amazing how bad the food was. I got salmon that was overcooked and tasted dry and bitter. The manager was very gracious and offered something else. I got lambchops which were cooked well, but extremely salty. The asparagus was undercooked and something called a timbale was mushy. The salad was good. I don't think they had a chef, only line cooks. Three of us had dinner last Friday June 13 what a disappointment! in total, we kept closing our check with Rachel because we were so disappointed at each course but the music and wine kept us going. When we did leave with continued on to Marin Joe's because we were still hungry! never again will we dine at Noonan's. I've eaten at Noonan's many times over the years and had nothing but great food and great service. I'm surprised about the other comments on this site. I'll be going back soon.